Despite a rapid local sea level rise rate nearly 3 times the global mean (1.8 mm/yr), 15 of 28 studied atoll islands in the southwest Pacific increased in shoreline area during 2005 to 2015 according to a new study (Hisabayashi et al., 2018). 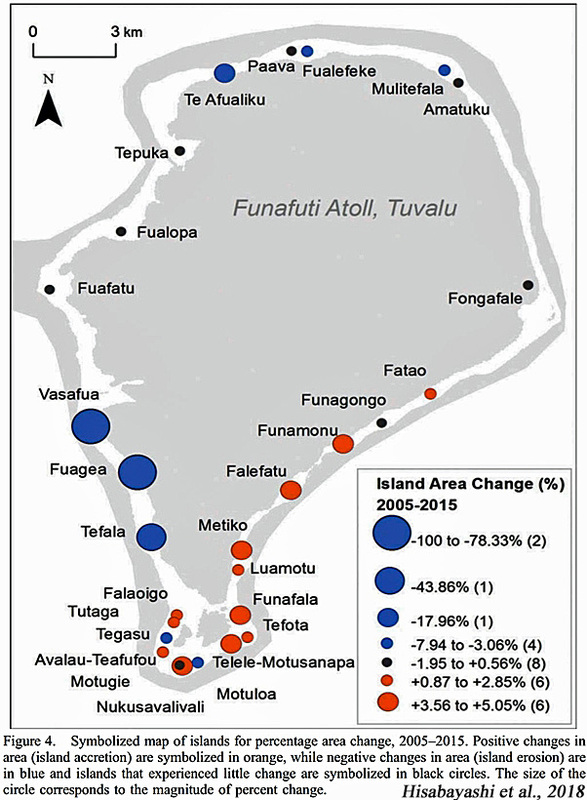 For the 3 islands that experienced extreme shoreline erosion – with one atoll island even “disappearing” – a Category 5 cyclone was identified as the most likely causal factor. Consequently, the authors conclude that “the dramatic impacts of climate change felt on coastlines and people across the Pacific are still anecdotal”. Are we cherry picking again or will you finally accept what accelerating sea level rise means? 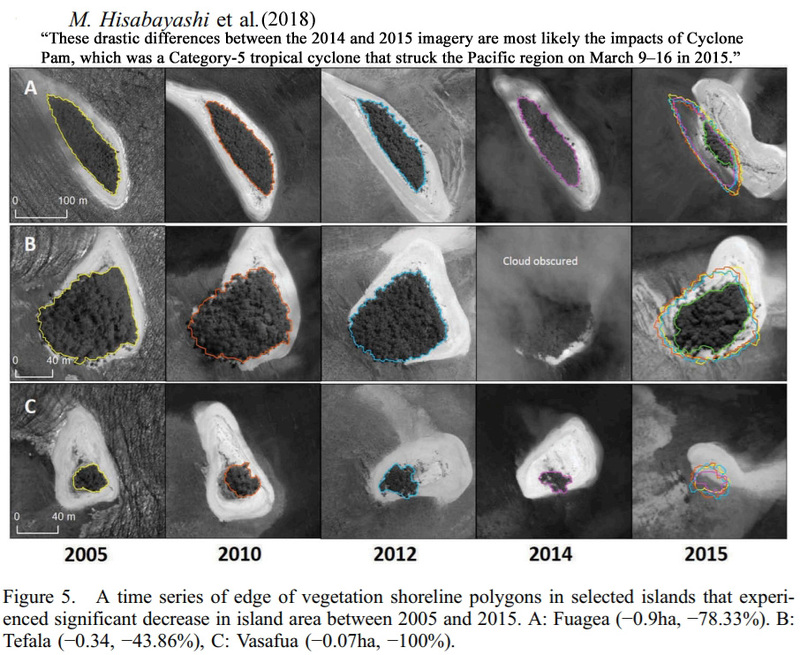 So we have an entire paper devoted to the subject of studying the shoreline changes for 28 small islands in the SW Pacific, of which 15 had their shorelines grow and 13 had their shorelines decrease (with the most pronounced losses due predominantly to a Cat 5 hurricane). You find a quote that says that there is “little doubt” that sea level will continue to rise regardless of what happens with CO2 emissions. So apparently you think that summarizing what the article says by directly quoting from the abstract and conclusion and the main results is “cherry picking”, but the selected quote you’ve highlighted here that refers to CO2 emissions (the only time CO2 is referenced in the entire paper) in the middle of a paragraph on page 3 (I had to search hard for it) is what the paper is really about? And we are cherry picking? Picking only what you like from a paper and presenting it like shorelines had actually expanded (title of this post) is cherry picking. but the selected quote you’ve highlighted here that refers to CO2 emissions (the only time CO2 is referenced in the entire paper) in the middle of a paragraph on page 3 (I had to search hard for it) is what the paper is really about? Nope, you misunderstood that on purpose I guess. I commented to highlight that this paper contains things you don’t agree with, yet you chose to present those things that sound like supporting your “skepticism”. I asked you if you are cherry picking again or are you ok with the rest of what the paper says. What is it? Where in the paper is there any scientific EVIDENCE that sea level rise will accelerate, seb ? So funny that you are SOOOO brain-hosed with the AGW meme , that you didn’t see it as an non-science throw-away line. Huh? I quoted the section that mentions multiple papers about that topic. Are you blind? And why would it not be accelerating as it has in the past 60 or so years? And only a mathematical imbecile takes any notice of s graph splicing satellite data onto tide date, and discontinuing the tide data. But that is you, isn’t it seb. 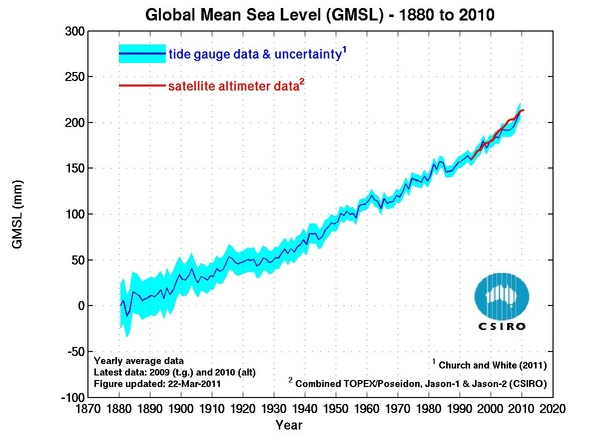 There is absolute ZERO sign of sea level rise acceleration except in the “adjusted” satellite data. As you pointed out the other day, seb, tide gauges not showing any acceleration, just a cyclic trend on a steady linear base. Anything else about future acceleration is purely and simply wacked-out model-based crystal ball gazing. I think he’s talking about what’s been found in the peer-reviewed scientific literature. And I did point that out? Ha, good one. No oscillation about a nearly perfectly linear trend visible. No, not long enough. The 100-year trend shows a deceleration, as the first half of the 20th century had a higher rate (2.03 mm/yr) than the second half (1.45 mm/yr) (including 1958-2014, which was also around 1.4 mm/yr per the Frederiske paper). Or the one at the top of this blog post? Do you happen to know why? Only a mathematical imbecile takes any notice of a graph that substitutes “adjusted” satellite data for tide data part way through. Why use such a short period when data is available for much longer periods and shows just a steady tend? Seems you have yet again attempted propaganda DECEIT. You don’t even pay any attention to the graphs YOU post. No wonder you get constantly left behind. Enlighten me, what graph did I post? Or was it just a repetition of a graph Kenneth posted and your lacking reading comprehension skills make you think it was I who posted it? Do they provide any data to back it up ? Seems they ruined an otherwise good paper by bleating the scientifically unsupportable AGW mantra. Sure, they are pushing global warming, but they are decoupling sea level rise from CO2, saying the oceans will continue to rise no matter what it’s concentration is – even if it drops. They don’t want you to think the problem will go away if CO2 levels go down. The safety of those islands will still need further study. And they are just the scientists to it, too. No, no. Don’t thank them. They are happy to do it. Sure, they are pushing global warming, but they are decoupling sea level rise from CO2, saying the oceans will continue to rise no matter what it’s concentration is – even if it drops. Oh, dear me. You mean he wasn’t talking about CO2, but about “…CO2 EMISSIONS?” (insert scary music here) And what he was really saying was that emissions reductions, AKA Trillion dollar Kyoto style protocols are a useless waste, because they can’t reverse the unstoppable imaginary looming disasters???!!! Ah, but surely they aren’t a waste, because without them climate “scientists” wouldn’t have the funding to keep stoking the hysteria, and would then have to find REAL jobs, poor things. You have been caught out, YET AGAIN. Get over it and stop acting like a petulant child. The real problem is that these semi-scientists feel the need to add unsupportable AGW junk statements to papers to get through climate non-science peer-review. Oh, dear me. You mean he wasn’t talking about CO2, but about “…CO2 EMISSIONS?” (insert scary music here) And what he was really saying was that emissions reductions, AKA Trillion dollar Kyoto style protocols are a useless waste, because they can’t reverse the unstoppable imaginary looming disasters???!!! No, I replied because you somehow drifted into that conspiracy theme again. “They do this …”, “They don’t want you to think …”, etc. 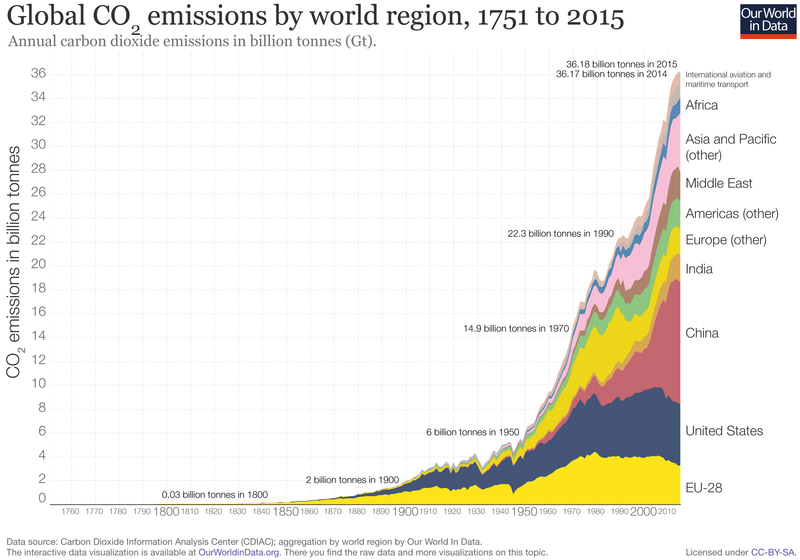 You don’t seem to understand that a reduction of the CO2 emissions will only stop the CO2 concentration increase if it is pretty drastic. And you don’t seem to understand that even at a constant CO2 concentration of whatever we have when we stopped the increase will cause warming of the oceans for quite some time. Nobody is saying it is unstoppable. That is entirely your imagination, Yonason. Why would the paper contain evidence about Yonason’s conspiracy addiction and lack of understanding? You can’t even answer two simple questions. John thinks that that grammar is getting in the way of what SebH believes. He looking at sentence that is put there to guarantee that the paper is published. He must read correctly because it is referred to future not a fact. SebH need admit that this difference. I think you need to open your eyes a little bit further or explain to me where my accompaning sentence “or will you finally accept what accelerating sea level rise means?” refers to past acceleration. Or are you trying to say that sea leve rise did not accelerate and/or is currently not accelerating? 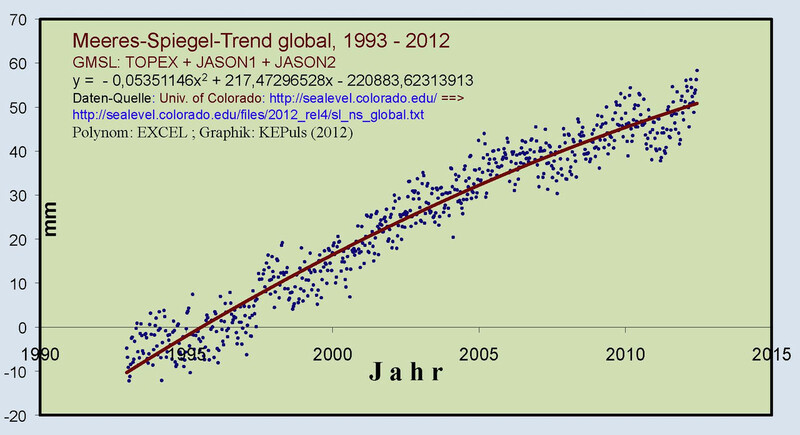 Sea level rise as measured by tide gauges is NOT accelerating. Yes there was a brief spike after this graph because of the El Nino, but not enough to change the general trend. Can you guess how many times you have ducked and weaves avoiding answering these two simple questions. There still grammar in the way. If there would have been an acceleration, they would have said: “did accelerate”. Since they used the term “will” it indicates that the study supports the notion that there was no acceleration before that. While seems John splitting hair this sort of reading (comprehension) is required in the space of climate science papers. I asked Kenneth “or will you finally accept what accelerating sea level rise means?”. Why do you think it matters if the paper wrote about past acceleration or future acceleration for this question? That is just crazy. If an author writes that the Sun will be going to rise tomorrow that doesn’t mean it did not rise the days before. What kind of logic is that? Seb is making up FANTASIES. Unproven CO2 warming being his deepest darkest wish, fetish, and fantasy. He dreams about finding actual evidence.. But it is turning into a nightmare for the poor scientific inebriate. We all know what “accelerating sea level rise” means. What you didn’t seem to notice is that the paper did NOT say that sea level rise IS accelerating. It says, quite unscientifically in my opinion, that sea level rise WILL accelerate. That is a fantasy about the future which has no place in a scientific paper. I don’t know if we all know this. There is AndyG55/Spike55 who thinks it’s “tiny”, but somehow doesn’t get that a 0.07 mm/yr² acceleration makes a difference of 3.92 mm/yr after 56 years. And of course we have Kenneth, who think sea level rise rates will soon slow down again because it is all periodical or something like that. He somehow doubts that a warmer world means higher sea levels and questions how the IPCC predictions could ever become reality even though a continued acceleration like we observed in more than 6 decades comes pretty close already. What you didn’t seem to notice is that the paper did NOT say that sea level rise IS accelerating. 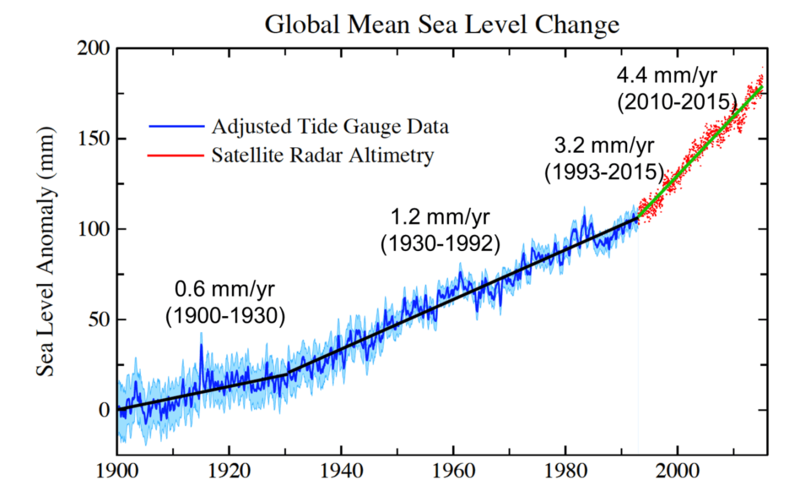 It says, quite unscientifically in my opinion, that sea level rise WILL accelerate. Doesn’t really matter. I asked if he finally accepts what accelerating sea level rise means, not if he accepted that sea level will continue to accelerate. There is AndyG55/Spike55 who thinks it’s “tiny”, but somehow doesn’t get that a 0.07 mm/yr² acceleration makes a difference of 3.92 mm/yr after 56 years. Then there’s SebastianH, who evidently doesn’t understand that the arbitrary starting point of a sequence is what determines the acceleration value, rendering the value itself statistically meaningless and the future projection of sea level rise speculative. For example, when starting in 1900, the acceleration is a “not significant” 0.0042 mm/yr, not 0.07 mm/yr, which gives us an entirely different projected value for 2100 if we use that value rather than the one that begins in 1958. And of course we have Kenneth, who think sea level rise rates will soon slow down again because it is all periodical or something like that. And here we have SebastianH, who evidently doesn’t understand what long-term oscillations in sea level rise records means. Nope. Haven’t written that. Sea levels rose at a rate of 3 to 5 meters per century as the world rapidly warmed naturally during the Early Holocene. It’s apparent that SebastianH has some difficulty understanding acceleration computation and the shortcomings of making future projections based on “exponential growth”. Why not begin much much earlier then? Maybe when the sea level was higher than today? No acceleration at all, right? Kenneth, when we are talking about man made client change, then there is usually a starting point where our influence began to make a difference. That starting point is not 1900. See how little sea level rise there were back then? Of course the acceleration from a point so far back is smaller. 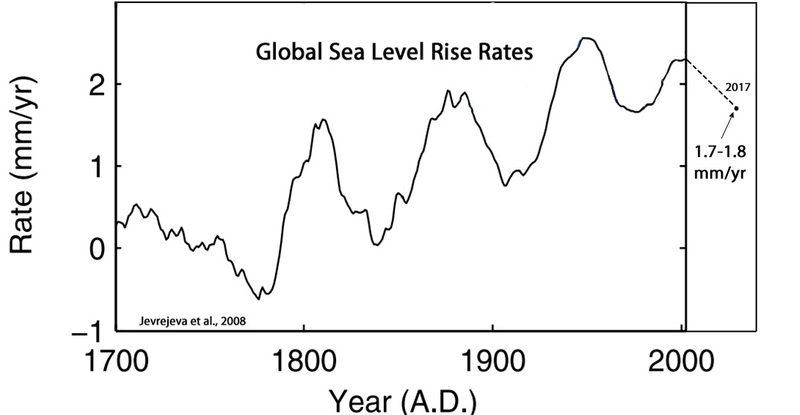 And then we have this: […] Sea levels are not presently positively accelerating worldwide. Do you see any long-term oscillation in this graph? OHC is increasing, glaciers are melting … the rise won’t slow down significantly until the imbalance caused by CO2 doesn’t exist anymore. Excuse me? You claimed that all glacier melt and thermal expansion is compensated by land water changes. You’ve written in this very thread that everything oscillates which kind of implies that somehow the sea level rise wont further accelerate in a warming world … since well, the world is warming. The future projections aren’t based on just extrapolating the rise from the past 60+ years. I thought you have looked into what “the other side” predicts and on what it is based. I just made the observation that it is not too far off of extrapolating the past acceleration into the future. The author wants the projections to be based on past trends? Isn’t that what you just argued against? Extrapolating the future from the past? Kenneth, when we are talking about man made client change, then there is usually a starting point where our influence began to make a difference. That starting point is not 1900. Correct. According to the IPCC, it’s 1750. That’s where all the radiative forcing values for CO2 start from. Sea levels are not presently positively accelerating worldwide (according to many peer-reviewed scientific papers). By a whopping 0.02 C since 1994. Whoop-de-doo. The oceans are cooling below 3600 m. What’s causing that? Yes, Greenland and Antarctica have contributed a whopping 1.5 cm to sea levels in 56 years, or between 1958-2014. And Greenland and East Antarctica have both been cooling in recent decades. Antarctica as a whole shows no trends since 1979.
the rise won’t slow down significantly until the imbalance caused by CO2 doesn’t exist anymore. So why is it that scientists don’t agree with you that an anthropogenic signal is even detectable? 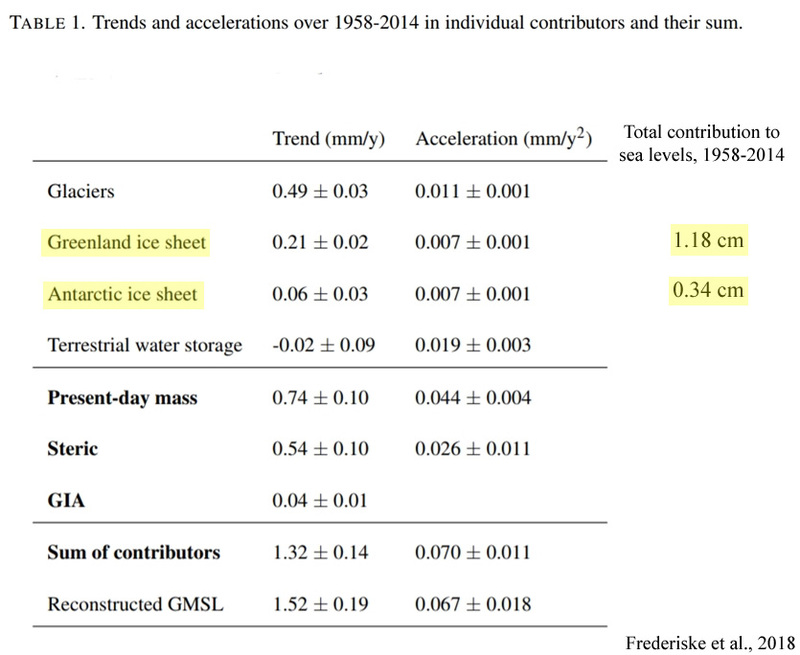 You claimed that all glacier melt and thermal expansion is compensated by land water changes. Nope, that’s not what I wrote. I wrote that the portion of sea level change attributed to terrestrial water storage, -0.71 mm/yr, can be said to effectively cancel out the sea level change attributed to thermal expansion, +0.64 mm/yr, using the data found in peer-reviewed scientific papers. The sum contributors to sea level change don’t add up to 3.5 mm/yr, more like 1 to 1.5 mm/yr, which is considered the global average. No, I’ve written that the rates of sea level rise oscillate on long-term time scales as shown here and thus picking a short-term starting point and claiming acceleration from that is likely to be invalid. Another starting point will yield different results. There is absolutely ZERO EVIDENCE that the OHC rise is caused by CO2 in any way. Your statement is UNSUPPPORTABLE by any known science. You know, when CO2 levels where much lower. NOTHING to do with humans or human emissions. You STILL haven’t answered those two questions. What? That’s the 1958-2014 graph, isn’t it? How does it conflict with this one? And why do you keep repeating that the rate was 2.05 mm/yr between 1900 and 1950 when the overall rise in this period was just about 50 mm? Question: do you know what W/m² number the OHC increase corresponds to? E.g. what amount of forcing is needed to change the OHC by the amounts we observe? Or are you going to throw in some “Hiroshima bombs per second” quote again to distract from your lack of understanding? Why do you ignore what a lot of other scientists are saying? Why are these scientists you keep quoting special? Because they confirm your bias? Nope, that’s not what I wrote. I wrote that the portion of sea level change attributed to terrestrial water storage, -0.71 mm/yr, can be said to effectively cancel out the sea level change attributed to thermal expansion, +0.64 mm/yr, using the data found in peer-reviewed scientific papers. The sum contributors to sea level change don’t add up to 3.5 mm/yr, more like 1 to 1.5 mm/yr, which is considered the global average. Another claim that is objectively not true. Or is this again not a claim of yours and you are “just repeating” what scientists say? Need more? How much further back to you need to go to accept that the rise is accelerating and will continue to accelerate because of global warming? No evidence warming will continue..
No evidence of CO2 warming. Poor seb, living in a little fantasy world of gullibility. “but somehow doesn’t get that a 0.07 mm/yr² acceleration…. blah blah.. But then you ruin it by a mathematically ignorant extrapolation. So a few comments back and forth on this topic in the last few days and you haven’t learned a thing? No, the current rate is not 1.7 mm/year. That’s the average in the period that saw an acceleration of 0.07 mm/yr². What is your average speed in these 60 seconds and what is your speed after 60 seconds? Now apply this newly gained knowledge to a sea level rise acceleration of 0.07 mm/yr² over 56 years. What is the average and what is the rate at the end of those 56 years? There has been NO ACCELERATION at tide gauges. And none in pre-adjusted satellite data. And yet again with the idiotic extrapolation. So funny that you are so mathematically DUMB that you actually keep doing it. Certainly NOT CO2, because CO2 cannot cause warming of the oceans or melting of land ice. It is not scientifically possible, and has NEVER been measured anywhere at any time. Stick to your brain-hosed fantasies, seb, its all you have. Yet again FAILS with his INADEQUATE understanding of maths. His IDIOTIC extrapolation of cyclic type data as though it is constant, tells us EVERYTHING we need to know about his lack of basic mathematical and scientific comprehension. Really? This is the only comment that made it through? Seb’s mind lives in a steel greenhouse. the atmosphere is NOT ANALOGOUS to a steel greenhouse. It is an irrelevant distraction.. like everything else. A distraction from your abject INABILITY to produce any science to back up the fallacy that is CO2 warming. The interesting part is the change in the gravitational constant note! To all the people with coastline property, due to the accelerating sea levels surely you must know that your property will be under water. I understand that insurance rates do not reflect this conclusion, but they are too dumb to see it. I am offering $1 US dollar per meter of shoreline. That is a very generous offer!